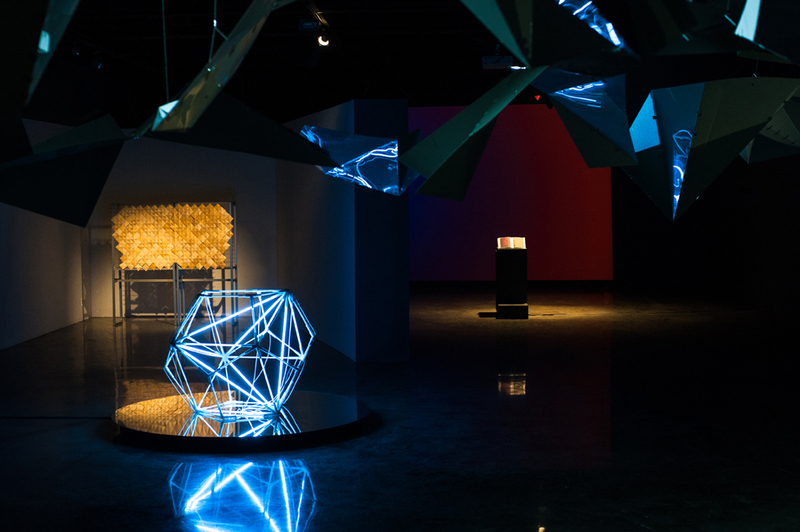 Younghui has participated math + science inspired art exhibition titled ‘Dynamic Structure & Fluid’ with her recent kinetic installation art piece, ‘Scales (200 cm x 200 cm x 40 cm)’ at the prestigous art museum in Seoul, Arko Art Center. This exhibition has seven art installations in both floors and the artists try to express scientific learning into art. 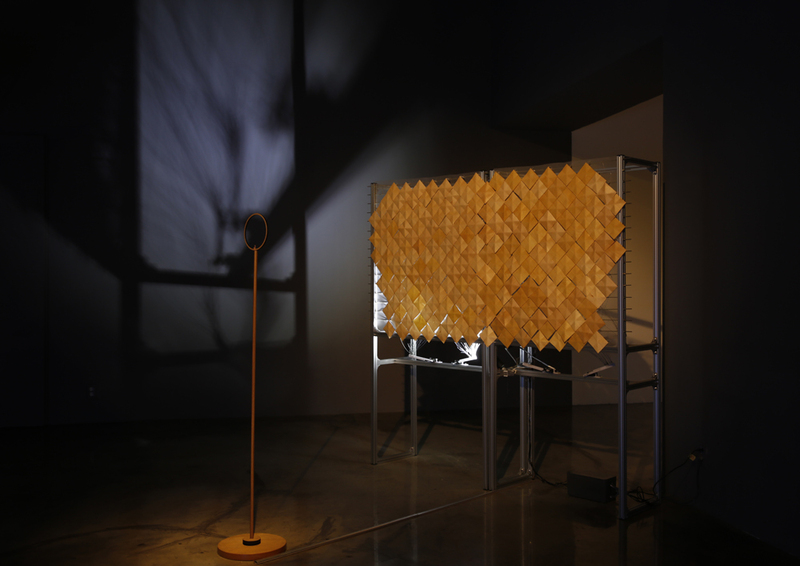 ‘Scales’ is an interactive installation that was inspired by pinecone scales and fibonacci’s numbers. These few hundreds scales are made of three different wood veneers that are 0.7 mm thin and cut into a square then hand folded. When a viewer blows his/her breath into the pole, the scales opens up kinetically. This project is a part of her ongoing projects inspired by pinecone scales. She plans to incorporate into different installation and wearables using different input data. 김영희 작가는 과학과 예술을 연계하여 기획전시된 ‘다이나믹 스트럭쳐 앤 플루이드’ 에 인터랙티브 키네틱 설치작품 ‘비늘’로 약 두달 그리고 열흘간 참여하였다. (물리적으로 움직이는 키네틱 설치물을 두달이상 이상없이 전시할 수 있도록 하는 것은 쉽지않은 일이었지만 다행히 별무리없이 진행되었다.) ‘비늘’은 약 2미터 넓이에 2미터 높이의 설치물이며 자작나무 등을 포함한 세종류의 0.7 밀리미터로 얇은 두께의 나무를 종이에 붙여서 잘라 접은 약 240개의 비늘들이 입김을 불어넣을 때 마다 살짝 열리는 작품이다. 이 작품은 앞으로도 계속 여러 버전으로 진행될 작품의 한 버전이다. 나무의 냄새와 움직이는 소리, 수백개의 선의 움직이는 그림자 등이로 이 설치작품은 자연의 비밀에 대해 이야기를 하려고 하고 있다.